You're sitting at your guided reading table, your little group gathered around you, wide-eyed. Or are you the one who's wide-eyed? Sure, you know what you're doing, but maybe right now you're thinking your lesson plan doesn't fit the book like you thought it would. Or that maybe your lesson plan is just lame. Or maybe you don't have a lesson plan and are winging it (oh, come on, we've all been there). "Boy, I could really use a mini-lesson right now," you think. "One that gets my students into the heart of this book. One that gets to the heart of the Common Core. Uh, maybe one that touches the heart of my administrator who just so happened to 'pop in' and get comfortable." 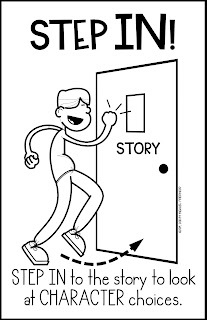 Here's something to try: I call it the "Step In - Step Out" strategy. 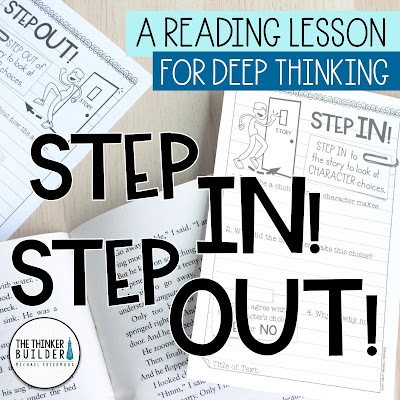 It's one of my go-to ways to get kids deep into a text, analyzing it from different perspectives and discussing it with each other. It's my take on thinking within, beyond, and about the text. 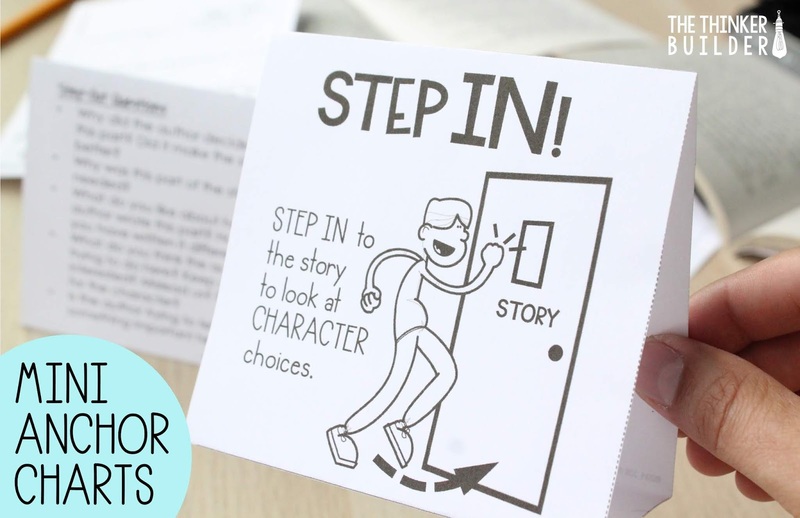 Asking students to "step in" to the story means that students enter the world of the story to analyze the choices the CHARACTERS make. Use some of the anchor questions below to get students stepping into the story. Why did this character make this choice? What do you think of the choice this character makes? Would you have done the same? What might have been a different choice? Was there an alternative? What happened because of this choice? What advice would you give this character? Asking students to "step out" of the story means that students look at the story as a piece of writing, and analyze the choices the AUTHOR makes. 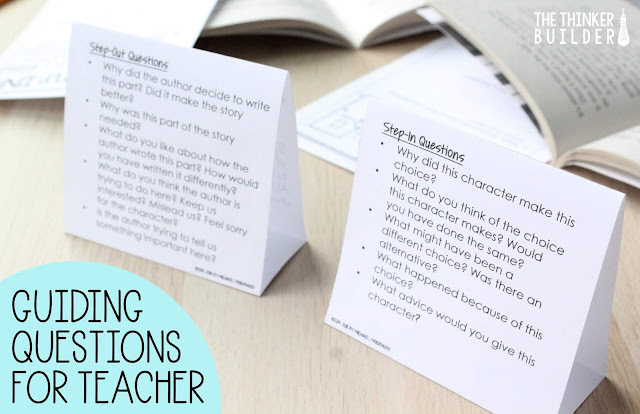 Use some of the anchor questions below to get students stepping out of the story. Why did the author decide to write this part? Did it make the story better? Why was this part of the story needed? What do you like about how the author wrote this part? How would you have written it differently? What do you think the author is trying to do here? Keep us interested? Mislead us? Feel sorry for the character? Is the author trying to tell us something important here? Let's get back to your lesson. 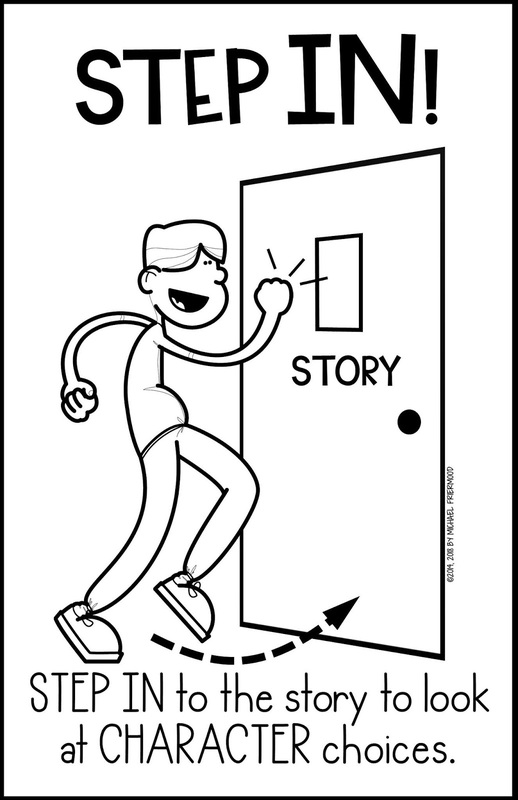 "Today, boys and girls, I want you to 'step in' to the story while you are reading. Get in there with the characters. Watch them closely. Listen to what they say to each other. Notice what they do and WHY they do it, especially that main character. Be thinking about the choices she makes. I'll check in with each of you while you are reading to help you out. Alright, get started." "So you just read that Sue Ellen is going to meet her friend at the park to give her the message, even though her mother said to finish her chores first. Hmm, what do you think about that decision? Why would she do that?" You keep your conversations brief, even leaving some thoughts "hang" as you move on to visit each member of your group. After students have read for a few minutes, you bring them back together. "Let's go back to when Sue Ellen went to the park. Who thought that was a wise choice? You don't, Taylor? Why not? Let's go back to that part of the book and reread it out loud... So, did she think about the consequences? Have you ever been in a situation like that? Could she have done something else instead, and still get her message to her friend?" 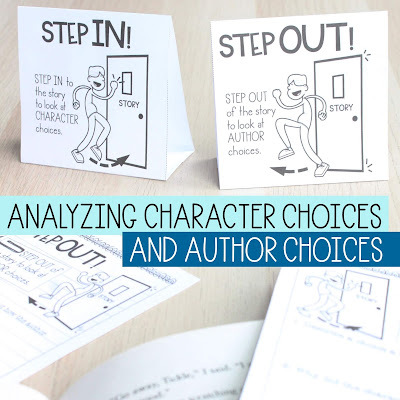 Getting students to think about the choices characters make, the causes of those choices, as well as their implications, grounds students' comprehension. It helps to guide readers through a text and build their understanding. 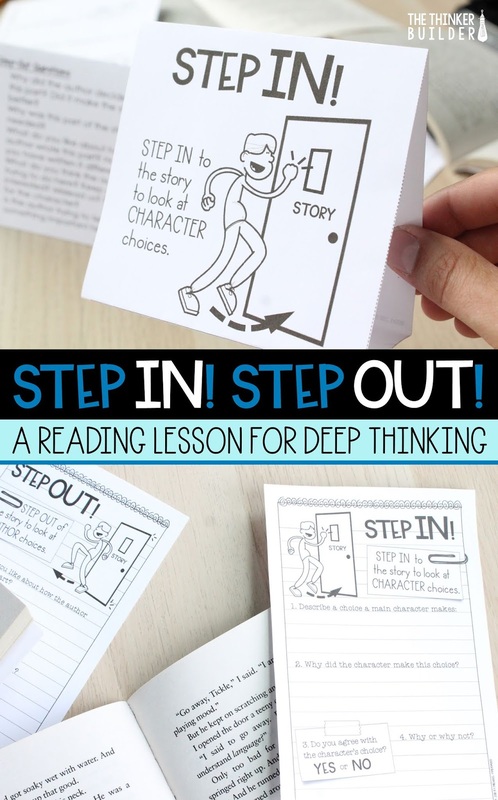 Eventually, you pull out the "Step Out" mini-anchor-chart. 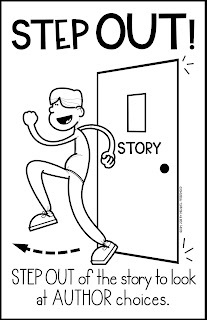 "So now I want you to step out of the story for a moment. Think about how the author wrote this part of the story. Why does it make sense to have Sue Ellen go to the park and defy her mother? Or would a different choice make more sense? Would the story be better if the author had Sue Ellen listen to her mom? What else in the story would have to have changed?" 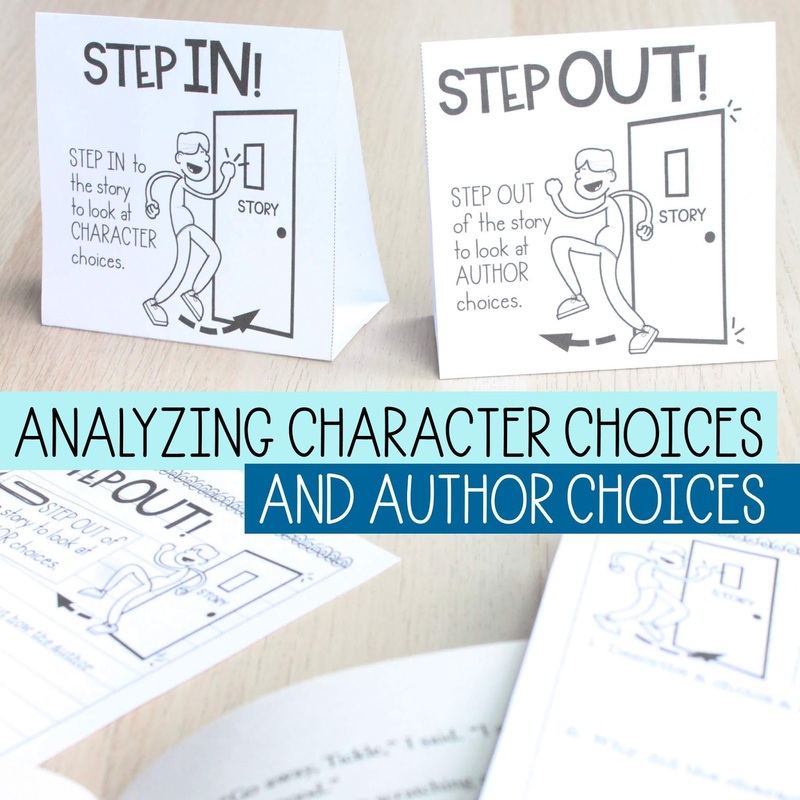 Getting students thinking about what the author was thinking can have far-reaching effects. Not only do students get to engage in higher-level, text-based discussions, it can be empowering to have the freedom to critique an author's decisions, and often can translate into how students make their own writing decisions. You might want to close by giving your students the chance to respond in writing. And as they go about transferring their thoughts to paper, you sit back, breathe out, and give your boss a little wink. 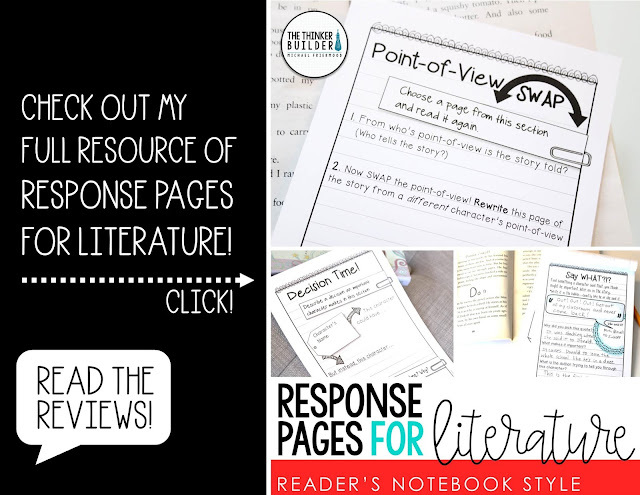 I've got all the materials for the lesson you just had, including the response sheets, for you to download for FREE from my TeachersPayTeachers store. 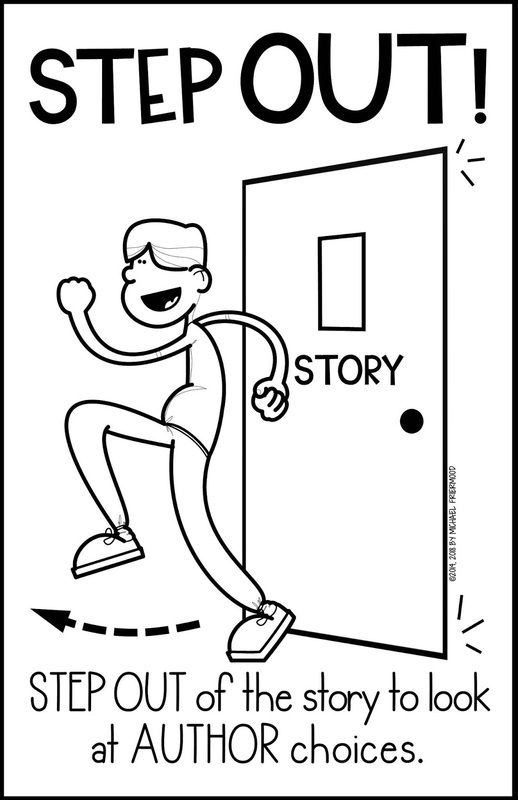 Click the image below to take you to the free resource. 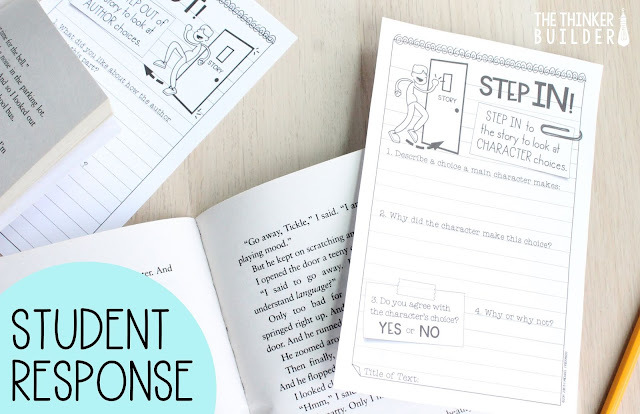 If you like the "reader's notebook style" response sheets included in the Step In - Step Out resource, check out my huge collection of response pages, to use with virtually any piece of literature. Included are 64 unique response pages for character analysis, setting, comprehension strategies, word study, author's purpose, extending meaning, note-taking, open responses, and more. Differentiated at three levels to meet all your readers' needs. Click the image above for more details.